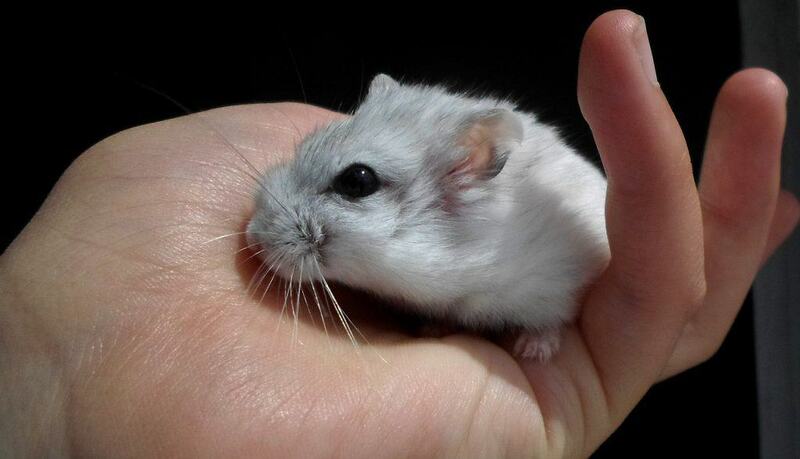 All hamster owners worry about their furry friend escaping from the safety of their cage. It can be especially worrisome when the hamster seems quite intent on doing exactly that. What drives hamsters to try and escape the comforts of their cages and get out into the home, where they become more vulnerable to injury? We’ve done the research to bring you the answer to that exact question. What an owner may see as an attempt to escape is just a hamster who’s looking for adventure. Quite simply, a hamster will always try to explore away from the cage. To help your hamster live a happy life make sure the cage – or tank – is large enough and offer plenty of options for exploration and play. And above all, make sure they are escape-proof. Because even the happiest of hamsters will eventually try to get out – given half the chance. Hamsters, just like us, require entertainment and stimulation. Fortunately, there are lots of things that you can do to facilitate this in their cage. The addition of toys, chews, hammocks, houses and other fun elements can really curb this behavior. 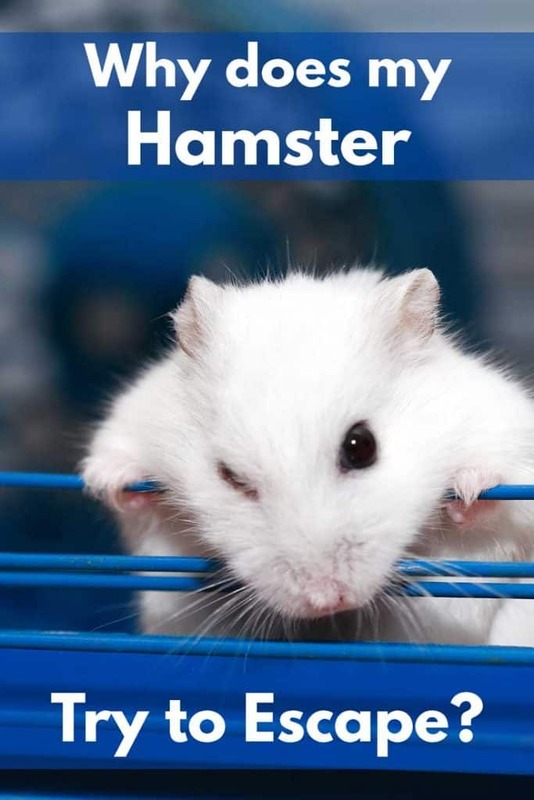 Continue reading to learn all of the steps that you can take to put an end to boredom and, hopefully, your hamster’s escape attempts. If you observe your hamster every day (which you should), you will be able to tell when he or she isn’t quite acting like themselves. The signs of boredom make themselves pretty apparent. You may see your hamster suddenly becoming hyperactive or decide that their time is better spent sleeping all day and night away. Another indicator of boredom in hamsters is avid chewing. Now, hamsters love to chew on things even when they aren’t bored. Their incisors are constantly growing, so this behavior helps them to keep their teeth at a good length and help with cleanliness. 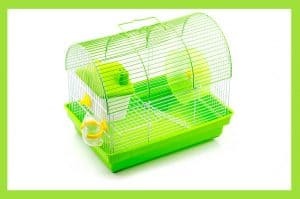 But if your hamster is chewing on the bars of their cage, this can pose an escape risk if left unaddressed. As our article about bar-chewing explains, your hamster is not likely to chew their way to freedom. This can certainly happen if you are using an old and worn-down cage, but most modern metal cages are too tough for even the most determined hamster to chew through. Still, you want to address this behavior and get to the root cause. If your hamster is bored enough to be chewing on the bars of their cage, they’ll likely try to make a great escape if the opportunity presents itself. Addressing Boredom: What Can You Do About It? Quite simply, hamsters need things to do! While your hammy might not be the most active during your waking hours, at night they like to get physical and engage with their environment. Their cage needs to offer them plenty of opportunities to act out their natural instincts, such as chewing, running and burrowing. Are you worried that your hamster is bored? Our article, ‘Is My Hamster Bored?’ tackles this subject to help you find a happy ending for both you and your hammy. One of the most important takeaways from this article is the necessity of hamster wheels. If you don’t have a hamster wheel for your hamster’s cage, get one as soon as possible. Leave it in, or attached to, the cage at all times so that your hamster can use it at their leisure. Don’t remove it at night because you’re bothered by the sound. Instead, you can invest in a smooth-operating wheel like the Silent Runner, which is sold in Amazon. 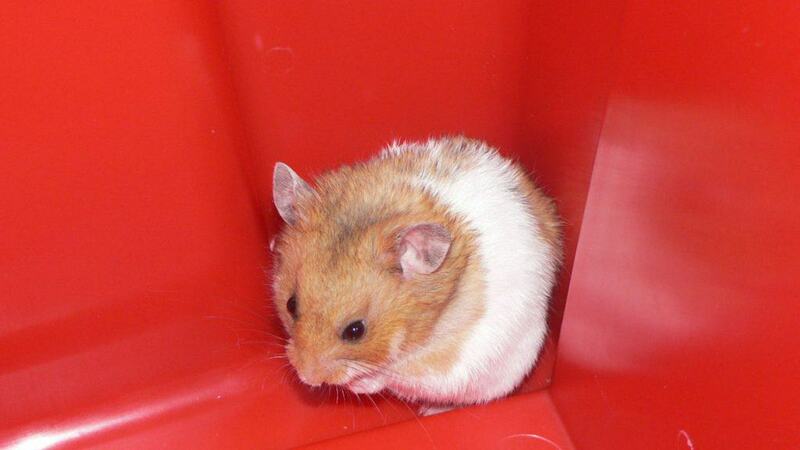 Hamster wheels are one of the most effective energy-burning tools that you can offer your pet. 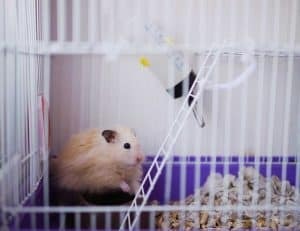 Still, running is only one of many instinctive hamster behaviors that owners should try to facilitate in their hamster’s cage. You also need to give them plenty of opportunity to chew and burrow. They also need toys and other forms of stimulation, like tunnels. So, make sure that you are providing access to these things when your hamster is in their cage, at all times. So, you’ve gone to the pet store and furnished your hamster’s cage with all manner of entertainment and stimulation – but they still seem to want to escape. What on Earth is going on? You might not be surprised to learn that, sometimes, being confined to a cage nearly 100% of the time isn’t all that exciting. Even when you’ve got every item that a hamster could dream of in their cage, some time spent outside of the cage can be tremendously helpful at easing boredom. Whatever your home’s space allows, you should try and get your hamster some safe and supervised time outside of their cage. Our article on this very subject will tell you how to do exactly that: Should You Let a Hamster Out of Its Cage? It is worthwhile to allow your hamster some space to roam openly in a portion of your home. This can be a whole room, with things like wires and other dangers being taken into account. It could also be a playpen that is large enough to let them run and play to their heart’s content. The key is to create a safe environment for your hamster to play in. And even then – only under your complete and attentive supervision. Hamsters are small and vulnerable – and they need you to keep them safe when they’re outside the tank. Should you use a hamster ball? Hamster balls are commonly used by owners who want to give their hamster the freedom to roam every once in a while. When used under direct supervision and purchased at the proper size, a hamster ball could potentially be a great way to burn energy and kill boredom. But keep an eye on your hammy. Some hamsters may not like being in the ball at all, as it prevents them from properly interacting with the environment that they explore. If you want to try a hamster ball, limit the time to a few minutes at a time. Carefully watch your hamster and don’t allow him or her to exert themselves. 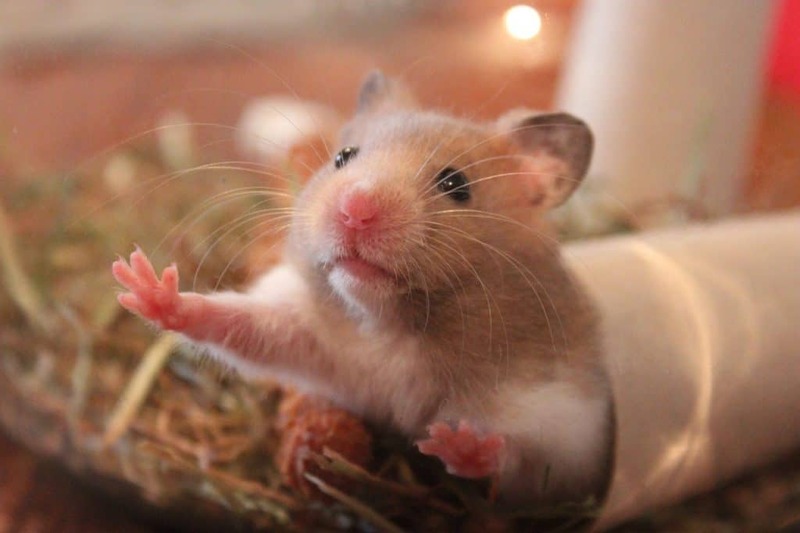 Read more: How long should you keep a hamster in a hamster ball? You might already be letting your hamster out of their cage every now and then – and that’s great! Still, it might not be enough. Your hamster might need extra time out of their cage, or you might not have been giving them enough “outside” time in the first place. Increase this time and you might see the would-be escape efforts come to an end. No matter what toys and accessories you add to your hamster’s cage, those things do nothing to address the problem of a cage simply being too small. If a cage is too small for your hamster to go about their daily lives comfortably, they will quickly grow to feel confined and restricted by their living space. Read our article about cage size to learn about a 2007 study that reinforces this fact and presents one simple truth: Hamsters are happier in larger cages. Obviously, not all homes have an unlimited amount of space that can be dedicated to a supersized hamster cage. Regardless, it is still important that hamster owners provide as large a hamster cage as their space will allow. The bigger, the better. They’ll have more room to live their day-to-day lives and you’ll have more room for all of the fun toys and accessories that you want to give your furry buddy. A great way to create more space is by connecting more than one cage with hamster tunnels. These plastic tubes allow a hamster to roam around from one habitat to another, just as they would in a natural setting. Help! My Hamster Has Escaped! If this happens to you, don’t feel like you’re a bad owner. Even the most devoted and cautious hamster owners have experienced an escape. Hamsters will leave their cages if given the option, such as through a busted lock or a door left open, even when they aren’t bored. They’re curious creatures that love to explore. Once an escape has been foiled and your hamster has been returned to the safety of their cage, it’s time to take a look at the cage itself. You need to determine if the escape was simply an accident, such as due to a latch that didn’t close all the way or was intentional due to your hamster’s boredom. If you’re worried that the latter issue played a part, consider making some of the changes that we outlined above. A hamster’s environment has everything to do with how happy they are, so it’s important that you make their environment as nurturing as possible. Large cages that are filled with toys, snacks and accessories will keep your hamster feeling happier and more relaxed in their space. Time spent outside of the cage is just as important to keep in mind when you want your hamster to live their best life. Make sure that, at least once a week, they get to spend some time outside of those four walls that they live in day-to-day. Remember: You don’t have to give them full run of the house to do this. A safe room or spacious playpen is just fine. 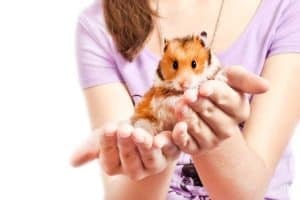 When you keep this information in mind and make any appropriate changes to how you handle your hamster and/or their cage environment, you could make a tremendous difference in your hammy’s behavior. If they feel fulfilled and relaxed, the urge to bite and claw their way to freedom will lessen or even disappear. After all, you wouldn’t like to be stuck in one room with nothing to do and no option to get outside every now and then. Hamsters don’t appreciate it either.